$64,000 was on offer to anyone who imitated Bobby Fischer’s perfect score at the 2014 US Championships, but after three rounds no-one was left in the running. 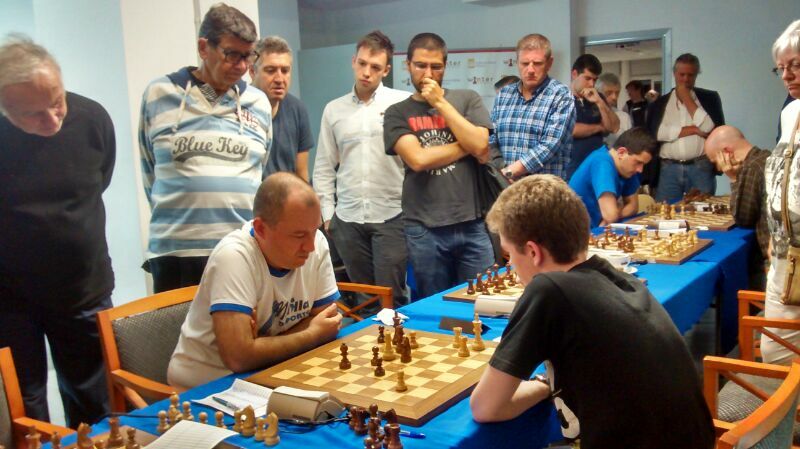 Meanwhile in Llucmajor on the Spanish island of Majorca Sergey Fedorchuk has scored 6/6 in a strong open featuring players such as Julio Granda, Simen Agdestein and 18-year-old Spanish GM David Antón. IM David Martínez – the latter’s coach and our Spanish editor – wrote a sparkling piece about the tournament in Spanish. He added, “if you want to translate change Belen Esteban to Paris Hilton”. How could we resist! His style is founded on exceptional strategic understanding and a well worked-out repertoire that he rarely varies from – 1.e4 with a range of main lines, while with Black he plays various Sicilians or the Nimzo-Indian/Queen’s Indian against 1.d4. Since reaching 2600 in January 2007 his rating has been very consistent with some peaks around 2670, which is impressive considering the number of opens he plays. Solodovnichenko is in the process of recycling his knight. If it reaches f6 via d7 Black will have everything under control and should have few problems drawing, but the manoeuvre will require even more time than it takes me to spell his surname... Fedorchuk exploits that to perfection. 19... ♕c7 20. ♖xf8+ ♔xf8 21. ♕a3+! everything goes like clockwork for White. 21... c5 22. ♕xa7 cxd4 23. ♕xd4 and although there was a lot of technical work ahead Fedorchuk converted his extra pawn with no great difficulties. We've got a position where neither side seems to have any weaknesses. White is trying to generate some kind of attack on the kingside but, at least for the moment, that's a long way off. Many players would simply have played 17... Rd7 and, after the doubling of rooks and mass exchanges on the d-file, a draw would have been agreed. 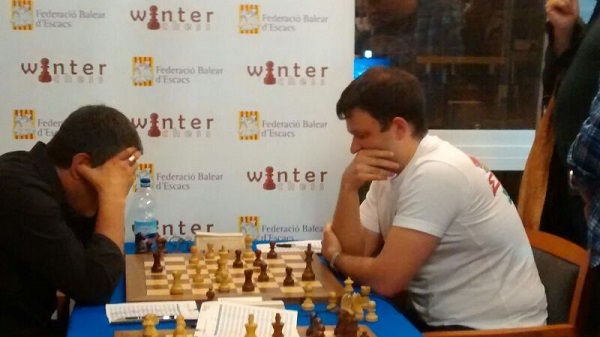 Fedorchuk, however, has detected a weakness in the white camp - the c5-pawn! 17... ♗a5! A wonderful positional move. The bishop is heading to b4 to put pressure on c5. 18. ♖c2? Movsziszian could find no way to stop Black's plan, though miraculously there was one! 18... ♗b4 19. ♘f5 Looking for counterplay. 19... ♗xf5 20. ♕xf5 ♘d7 21. ♕g4 ♔h7 Preventing Bxh6. 22. ♖fc1 ♗a3 23. ♖d1 ♘xc5 Mission accomplished! Once more, after a long fight, Fedorchuk made his extra pawn tell. Both players are short of time and on the verge of agreeing a draw. With 46. 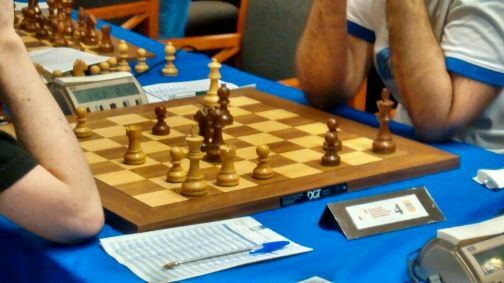 Kg1 Anton could have repeated the position for a third time, which would have been normal since the c1-f4 perpetual check with the black queen seems inevitable. But the elixir of youth, the desire to improve or an excess of adrenaline encouraged David to play for a win with one of the ugliest moves of his chess career. 46. g3⁇ A move which, in effect, prevents the perpetual and... The list of pluses ends there. The pawn advance both weakens the second rank and the long diagonal and even involves further colateral damage - the h3-rook is converted into a piece valued less than common sense in the home of Paris Hilton. 46... ♕g4 won immediately because, as usual, a bad piece not only has reduced mobility but also turns into an easily-attackable weakness. The h3-rook will be lost after Bd7. 47. ♖g2 A critical moment. Colovic had 2 minutes left and needed to find the only move for Black to press his initiative and remain in the game - otherwise the white queen is ready to return and defend. 47... ♕f5⁇ He didn't find it! 47... ♘d2‼ was the beautiful tactical resource that Black had at his disposal. 48. ♖f2 The only move. (48. ♖xd2 is met by 48... d4 and the coordination of the queen and light-squared bishop will prove decisive.) 48... ♘f3+ 49. ♖xf3 ♕xf3 50. ♕d4 and David could still have put up a lot of resistance. 48. ♕b8+ ♔h7 49. g4! And magically the white queen coordinates perfectly with the two rooks to create a lethal attack on the enemy king. 49... ♕f1 50. g5 hxg5 51. hxg5+ ♔g6 52. ♕e5 ♕f5 53. ♖h6+‼ And in an almost poetic turn of events the much-maligned rook that felt so useless on h3 goes down in history by striking the decisive blow. 53... gxh6 54. gxh6+ ♘g5 55. ♕xf5+ ♔xf5 56. ♖xg5+ And the h-pawn queens.